With extensive forest trails that are perfect for bike riding, hiking, 4WDriving, horse riding and photography, and serene picnic areas, it’s truly an environmentalist’s heaven. You’ll be hard pushed to find such diversity elsewhere. 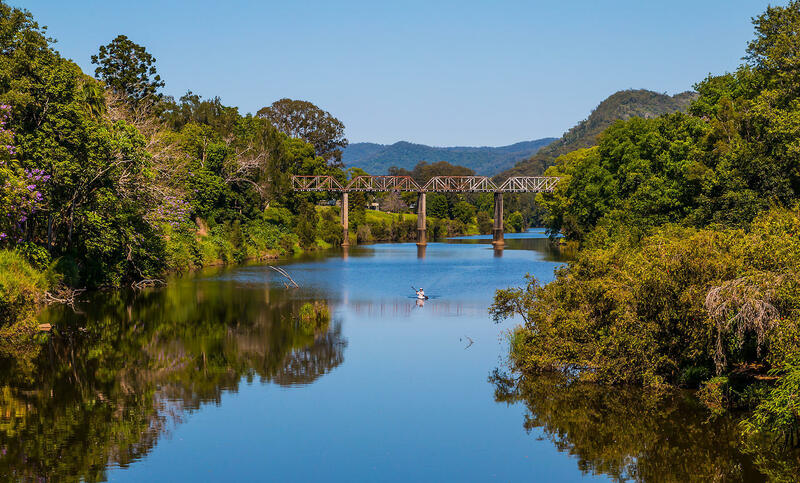 The Mary River runs through the Mary Valley and offers a variety of water sports such as canoeing, kayaking and fishing. The River’s creeks and tributaries offer paddlers unique challenges in irreplaceable surrounds. Whatever your budget, it’s a great way to great to get the kids off their phones and back outdoors. If you want something more relaxing, you can go for a refreshing dip or canoe to a secluded picnic spot. Explore over 480 hectares of waterway! Early morning kayakers will be rewarded with a profusion of birdlife with upper reaches of the dam offering many inlets to discover. The dam is host to a number of annual fishing events so fish stocks are full all year round to encourage everyone from families, boaties to keen sporting anglers to enjoy the beautiful surrounds as they toss in a line and wait in anticipation for that exciting first bite. For some fast action, bring the boat for some water-skiing on the dam’s clear expanse of water. The Mary Valley is home to National Parks and State Forests. These can be explored, by car, bike or on foot or horseback. Check the details of each park for more information. Each village has parklands in the form of reserves, recreational grounds and reserves. These are marked on the village maps. The parks in Amamoor, Kandanga, Imbil and Kenilworth all have play areas for children and are close to public toilets. There are so many places to eat whether you fancy good old-fashioned food or top end cuisine. Make sure though that you taste some of the fabulous local cheeses, relishes and sauces on your stay. Mary Valley Country is famous for its dairy and beef industries. It has a diverse range of soil types and ecosystems enabling it to support a large variety of agriculture. This has encouraged a budding industry to develop in locally grown gourmet products. A variety of markets in the region and the Kenilworth Cheese, Wine and Food Festival showcase the valley’s fine foods annually on Easter Saturday. When you are out in your car exploring the area, look out for local produce at various loyalty boxes on farms and orchards along your way. Put the Mary Valley on your list of ‘must see’ places to visit today. You won’t be disappointed.